CRAZY DISCOUNT! Was: $139.95 Now: $64.88! 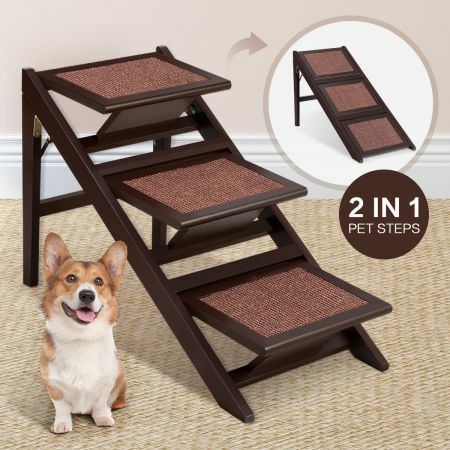 This Petscene 2-in-1 Dog Cat Stairs Foldable 3 Steps Pet Ramp Wooden Doggy Ladder provides a great and safe way for your cute Husky or Persian cat to climb up or down from the bed, couch, chair or other higher places. Made from pinewood, the dog steps are built to last for years in your house. The pet steps feature a durable sisal fiber surface that allows your pet to grind their paws and prevents your pet from slipping. The standard rise of 15cm guarantees young or elderly dogs to jump around. It can support a maximum weight of 68KG. Moreover, the stair ladder can be folded for convenient storage or transport. Look no further than this wooden dog stairs for the bed to create a living room for your pets. Conveniently store anywhere with foldable design. Pine Wooden construction with built-in carry handles. Beautiful wood construction with rich espresso colour, Suitable for small and large pets and pet use only.